How exactly does Solar Energy work? The most important thing to understand about solar energy is that it provides the energy for all life on earth. Every life form* uses solar energy either directly or indirectly to survive, and in the case of humans, to provide power in the form of electricity for everything we do. For an in-depth look at just how solar energy powers our stuff, take a look at our post on how does solar power work? as well as these solar energy diagrams. 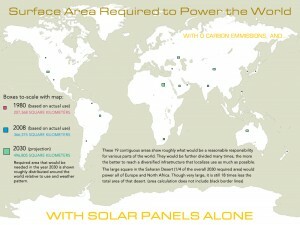 The amount of usable solar energy that strikes the planet is astonishing. Compare above to the total coal and uranium reserves available on the planet. 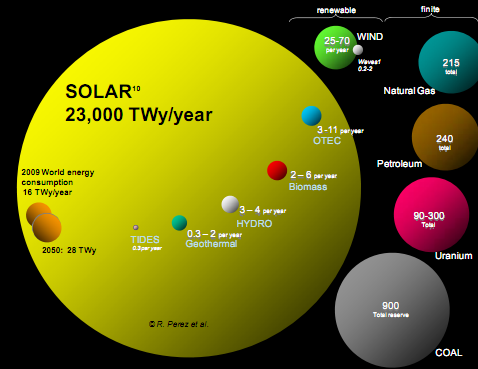 Note that nearly every energy source depicted above is a derivative of solar energy (either energy flow, like the tides, hydro, and wind, or energy stored by plants as in biomass and coal). The answer to ‘how’ depends on which question you’re asking. We’ll assume you aren’t asking about how the sun creates solar energy, the details of how it strikes earth, or how energy flows throw the planet in the form of weather, biomass, or the rest of the global ecosystem. We’ve covered some of this on the site already, but for a primer on how solar energy used to supply electricity works, see: How do Solar Panels Work? The basic idea is relatively simple: the sun’s energy strikes a solar panel, which is composed of individual solar cells. The solar cells convert this energy into DC current, which flows out of the panel and down to a solar inverter. The inverter converts the DC current to AC current (what your appliances run on) and Viola!, you have solar energy flowing into your home. If you’re actually looking to buy solar panels for your home, we’d recommend reading the section on solar myths.